The northern flicker is the most widespread North American woodpecker and one of the most distinctive members of the Picidae bird family with its bold, colorful markings. Its two major subspecies, the red-shafted and the yellow-shafted, were formerly separate species until they were merged in the 1980s, though some ornithological organizations still list these birds separately. These woodpeckers are also well known as the state bird of Alabama. This fact sheet offers birders even more information about flicker woodpeckers and all that makes these birds special. Northern flickers are easy to identify by their field marks and coloration, though the eastern flicker (yellow-shafted) and western flicker (red-shafted) have some distinct differences. Once birders learn the major field marks, however, they can confidently identify these woodpeckers with just a glance. Both flicker subspecies have long, dark, very slightly decurved bills, and their wings are broad with rounded tips. Males have a tan and gray head with a thick malar stripe. The back and wings are tan with black barring or scallops, and the white rump is easily visible in flight. The uppertail coverts are white with black spotting, and the stiff, two-pronged tail is black above with either red or yellow below. The underparts are buff-white with black spots and a prominent wedge-shaped black patch on the breast. Females have similar markings to males but lack the malar stripes. Juvenile birds are similar to adults. These are vocal birds with a variety of calls. The piercing “kyeeer” call is reminiscent of hawks but has a shorter duration. A loud, strong, even “wik-wik-wik-wik” call is also common. When drumming, these woodpeckers have an even, rapid tempo that lasts 1-2 seconds. Range is a good clue to tell the two subspecies of northern flickers apart, as the eastern birds show yellow under the wings while western birds show salmon-pink under the wings. The yellow and salmon colorations are also notable under the birds' tails. Red-shafted, western birds have a red malar stripe (males only), while only the yellow-shafted, eastern birds have a red nape (both males and females). The coloration under the birds' tails matches their regional coloration as well. Between the subspecies, the eastern, yellow-shafted birds are generally more tan or brownish on the face, wile western, red-shafted birds are more grayish. The northern flicker is found in open deciduous forests, woodland edges, marshes, and suburban parks, gardens, and backyards. These birds are found year-round in most of the continental United States, central Mexico and coastal British Columbia, but they are missing from southwestern Texas and Arizona, the northern Midwest, and the extreme northeast. The yellow-shafted subspecies is more common in the eastern and central portions of the range, as well as all of the Canadian range. The red-shafted flicker is most common in the western part of the range and north through British Columbia. On very rare occasions, northern flickers have been recorded as vagrant birds in northern Europe. While a large central portion of this bird's range is occupied year-round, in summer, the northern flicker's breeding range extends further north to include most of Canada and Alaska except the highest tundra regions. In winter they are found deeper in the southwestern United States and into northern Mexico. These woodpeckers, unlike most woodpecker species, prefer to forage on the ground for ants and beetles, and their antacid saliva helps defeat ants' acid defenses. 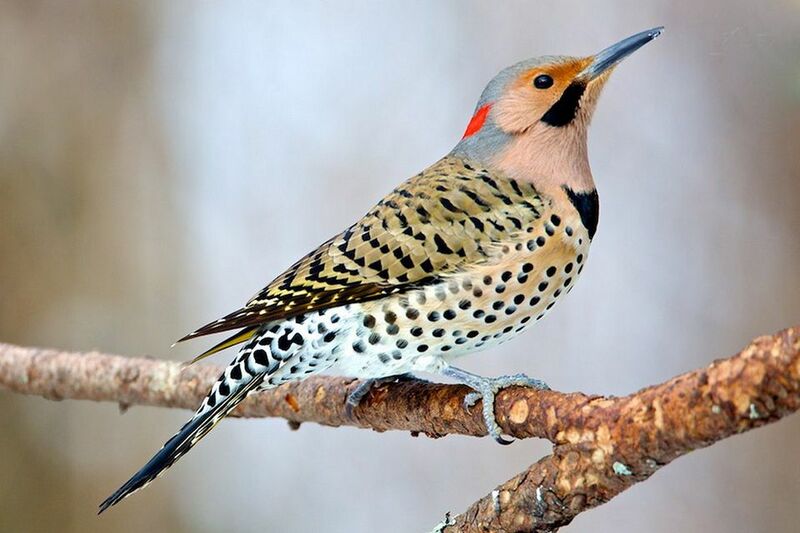 Northern flickers hop on the ground or cling to low stumps or at the base of trees, and when perched, they are often seen in a posture more familiar to passerines than woodpeckers, though they can cling vertically as well. During courtship, they are active and agile, and their undulating flight with rapid wing flaps and short glides is distinctive because it highlights their bold underwing colors. Like all woodpeckers, northern flickers vary their diet seasonally depending on what foods are available in their range. They are primarily insectivorous, but also eat different fruits, seeds, and nuts depending on season and availability. These are monogamous birds and both parents excavate a suitable nesting cavity or arrange the nest with minimal material. Northern flickers will sometimes use birdhouses or take over abandoned holes of belted kingfishers or bank swallows. In areas where the two subspecies' ranges overlap, hybridization is regularly recorded, and the young birds will have indistinct colors with more orange-ish hues. Northern flickers will also hybridize with gilded flickers in the southwestern United States. Each brood contains 3-12 oval-shaped, plain white eggs, and a pair of northern flickers will lay 1-2 broods per year. The second brood is most common in southern populations where the breeding season is naturally longer. Both parents incubate the eggs for 12-15 days, and both will care for the chicks for an additional 25-28 days after hatching. While the northern flicker is not considered threatened or endangered, its populations have been steadily declining in recent decades. A major cause of this decrease is believed to be competition from European starlings for the best nesting sites, and the woodpeckers often lose to the more aggressive invasive birds. Despite this decline, however, the northern flicker's widespread range ensures its continued survival. In the appropriate habitat, northern flickers will happily visit yards that avoid pesticide and insecticide use so there are more ants and beetles available for food. These woodpeckers will also occasionally use large birdhouses, and they will visit bird baths for drinking and bathing. Leaving dead trees and stumps intact will provide both foraging and nesting sites. These birds will readily visit feeders where suet, nuts, and black oil sunflower seeds are available. Northern flickers are not too challenging to find within their range, particularly if birders visit areas with abundant food sources. Nature centers and wildlife preserves that maintain feeding areas often attract northern flickers, offering visiting birders very good viewing opportunities. Watch for these birds to land on the ground as they forage, and note their clear field marks and plumage patterns for confident woodpecker identification. Don't forget to check out other detailed bird fact sheets to learn more about all your favorite species.